There’s a simple and vital, but easily overlooked, requirement for the advanced equipment being developed for soldiers on the modern battlefield, says Chief of Army, Lieutenant General Angus Campbell. No matter how marvellous is a piece of new gear, front line soldiers must be able to use it with ‘heads up, eyes on target, hands on weapons’. A moment’s distraction to look down at a screen can mean opportunities lost, or worse, Campbell tells The Strategist. ‘The point is that as we equip our soldiers we must enable them to do their job through technology, not disable them from doing their job,’ says the first Special Forces officer to command the Army. That must be the driver of the basic technological augmentation of the soldier. ‘When a soldier has to look down, and away from their target, there’s immediately the possibility that soldier is no longer aware of the situation that is changing,’ Campbell says. Some of a soldier’s new equipment, such as ballistic armour and helmets, is intended to increase his or her survivability. Radios and weapons are all about their capacity to influence the environment in which they’re operating. Campbell says a prime example of such new technology is the latest version of the Steyr rifle and new sighting systems, with which soldiers very consistently hit targets at 600 metres. ‘That’s at least double what you might normally expect. It’s a better rifle and a better sighting system and an average shot in the Army can consistently put 20 rounds into the centre of a half-metre target at 600 metres.’ This development has just doubled the effective range of influence on the battlefield of an infantry soldier. Equipment such as tiny drones make soldiers much more aware of the wider environment around them without exposing them to danger, and allows them to develop better plans and to more quickly seize the initiative. ‘They’re incredibly valuable,’ says Campbell. ‘From the smallest unmanned aerial systems to larger vehicles used tactically, we now have our people routinely aware of what’s going on, both to the distance that they can see and then well beyond line of sight. Advanced modern protective systems rely much less on the sheer thickness and weight of solid armour, says Campbell. The more effective those systems become, the more options you have for reducing the weight of your vehicle. At the same time, different forms of lightweight armour are being experimented with. That’s all about how to be protected but far more mobile, and hence more likely to survive on the battlefield. The ADF’s integrated investment program is designed to progressively upgrade or replace obselete systems. A second goal is to provide armoured protection to allow troops to manoeuvre safely on a battlefield. Campbell says the Army lives in a world in which there’s a great deal of military equipment modernisation and it needs to be competitive. ‘At the moment we’re not competitive in ground armoured vehicle capability. ‘It’s well and truly time to phase out of service the M113 armoured personnel carrier and the ASLAV reconnaissance vehicle,’ says Campbell. The third focus is on the ‘combat ensemble’, which not just enhances soldiers’ individual survivability but makes them a more effective and more aware influence on the battlefield. 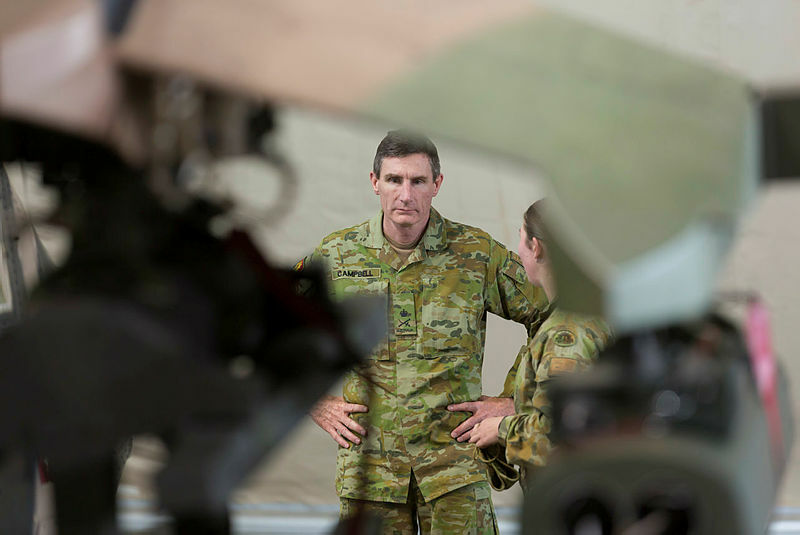 That’s where, says Campbell, the phrase ‘heads up, eyes on target, hands on weapons’ tries to focus the way in which the Army wants technology to help its soldiers.